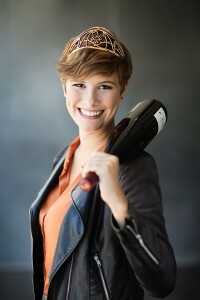 TORONTO, NOVEMBER 9, 2015 – Less than two months into her reign, German Wine Queen, Josefine Schlumberger, is setting a royal foot on Canadian soil, November 19 to 22, as part of a global road show organized by the German Wine Institute to educate wine lovers on the merits of its wines. She will visit the Gourmet Food and Wine Expo at the Metro Toronto Convention Centre, November 19 – 22. There she will share her knowledge of the country’s appellations at the Wines of Germany tasting bar, featuring more than 15 wines. The German Wine Queen title is a hotly contested national competition that pits regional wine queens against each other to determine who will best represent a German wine sector that is growing and rich in heritage. Participants must demonstrate clear and strong ties with German wines either through their own knowledge, training or ties to local wine production. Once victorious, after a nationally-broadcast TV extravaganza that this year took place September 25, the new Queen embarks on a grueling 12-month schedule of travel to more than a dozen countries. Canada is the first overseas country Queen Josefine has visited so far. “And there’s much to enjoy all year long with the first-class wines that Germany has to offer,” she added. A member of an active wine-making family in Baden, Queen Josefine, 21, is studying winemaking at the University of Geisenheim. Germany is the tenth-largest exporter of wines to Canada with approximately 490,000 cases sold in 2014, representing a total volume of $69 million in sales. The country is the largest producer of Riesling with 60 per cent of total Riesling production worldwide. It enjoys a growing presence in red wine as well thanks to Pinot Noir and increasingly popular wines from the regions of Baden and Ahr. Statistics from the LCBO reveal that Ontarians are enjoying higher quality German wines. In 2014, German wines witnessed double-digit growth in the category of bottles retailing at $15 and more. The Gourmet Food and Wine Expo features more than 1,500 fine wines, spirits and beers from around the globe and plays host to about 45,000 guests each year. To purchase tickets for the Gourmet Food and Wine Expo visit www.foodandwineexpo.ca. Each autumn, since the first German Wine Queen was elected in 1949, one woman from each of Germany’s 13 wine-growing regions competes to become the German Wine Queen, an ambassador for German wines worldwide. Candidates compete before a 70- member jury comprising professionals from the wine industry, government and media who judge contestants on their knowledge of complex issues related to wine, as well as poise, charm and confidence. The winner must be from a vintner’s family or have studied oenology, be unmarried, and a minimum of 18 years of age. The winner is announced during a two-hour television broadcast in Germany. Wines of Germany, the exclusive Canadian office of the Deutsches Weininstitut, aims to convey the character, breadth and quality of German wines to Canadians through educational and promotional activities. It is the primary information source on German wines and the country’s growing regions for members of the wine trade, media, and Canadian consumers. The promotional and educational efforts of Wines of Germany focus primarily on Riesling, the most famous German grape variety. Visit www.germanwinecanada.com for more information.